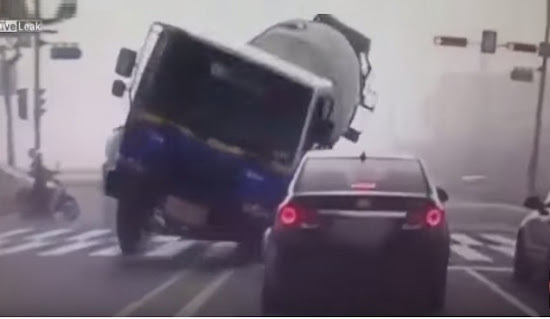 A daring driver’s decision to travel down a narrow country road in Taiwan, has cost him his concrete truck. Video posted on Facebook shows a cement truck leaning perilously close to a pond, after the country road gave way beneath it. Seconds later the cement mixer rolls onto its roof and lands straight into the water. The lucky driver managed to escape from the concrete truck, according to Taiwanese site ET Today. He was reportedly bringing in concrete to strengthen the earth and rock around the fish pond which has been loosened by recent heavy rain. The video was filmed by shrimp farmer Min Li Rong, who owns a nearby aquaculture farm in Chiayi, in the country's southeast. This is far from the first driver to regret a risky decision or miss the signs of an impending crash.